Complete REAL Douay Rheims Bible of 1610 - Life Quest® Formulas, Inc. This is the original and true, REAL Douay Rheims Old Testament published by the English College in Douay in 1610. It has been "lost" for over 423 years due its being in old English. Dr. William G. von Peters has transliterated the text into modern English. The English Crown did not believe in freedom of religion. It was illegal in England to own this Bible, and those found with the Douay Rheims Bible could have their properties confiscated, be imprisoned and tortured. Its copious marginal notes and voluminous annotations make it a superb study bible with references from the Apostles, Fathers of the Church and Saints. The price shown is for the digital download in PDF format. You may also purchase this with the CD for backup, or the CD only. See below for more information. For more information on the REAL Douay Rheims Bible, Click HERE! 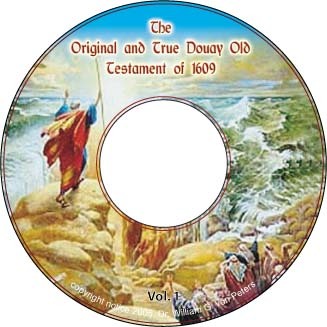 The original and true, REAL, Douay Old Testament of 1610.